Dental Implants are titanium “roots” used in dentistry to support restorations that resemble a tooth or group of teeth to be replace. Virtually all dental implants placed in the 21st century appear similar to an actual tooth root and are placed within the bone. The bone of the jaw accepts and osseointergrates with the titanium post. 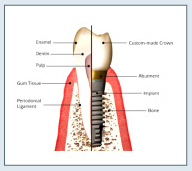 The osseointegration is the component of this implant procedure that makes it resemble the look and feel of a natural tooth. Dental implant success is related to quality and quantity of the bone available at the site, and the patient’s oral hygiene. The consensus is that implants carry a success rate of around 95%. The most important factors contributing to the success of dental implant placement, are the patient’s overall general health and compliance with post-surgical care. Diabetes and Smoking are the main causes for surgery complications, a thorough medical exam and smoking cessation are recommended before considering implants as an option. • They prevent bone loss from aging, sinking of the lips and resorption of your jaws. • They guarantee a strong set of teeth to maintain healthy nutrition in old age. • They prevent the domino effect caused by teeth drifting to vacant spaces. • Unlike a bridge, there is almost never the need to replace an implant.